If you are interested in finding unique ways to personalize your items, consider looking into creating your own custom monograms. A variety of free font software is available for exactly this purpose, making it easy for you to design your own monograms for linens, luggage, and even apparel. On the Mark & Graham website, you will find a tool to create your own personalized monogram for free. They say you can "make your mark" in just three easy steps. Enter between one and three initials, choose from a variety of different font styles, and select your preferred color. Once you are done, you can choose to save the file (it will be sent to you via email), share it on social media (Facebook, Twitter or Pinterest), or apply your mark on a personalized product from Mark & Graham like leather boxed coasters, bath towels, and wine totes. Similar to the tool offered by Mark & Graham, the WeddingWire Monogram Generator also consists of three simple steps. You also access and use it through any web browser. The designs are geared more toward weddings, but they can be just as easily adapted to other purposes. Enter up to three initials, choose from over 30 different colors, and then select from around 40 monogram designs. The designs are tastefully modern and offer a good variety. In order to get your monogram, you will need to create a free WeddingWire account. If you're going after a look that's a little less traditional and a little more contemporary, the Hipster Logo Generator is a great web-based tool you can use for free. The browser-based wizard walks you through step by step to create your own monogram in a modern, "hipster" kind of style. This starts by choosing a base shape (like a diamond or a shield), entering your letters and selecting the font, and adding some optional "swag" with special icons. At the end, you'll be able to download the PNG file for free, or you can upgrade to an SVG file and a high-resolution PNG for $10. While the software is not specifically designed for the purpose of creating personalized monograms, Microsoft Word can be adapted to this purpose. Monogram Momma offers some instructions and guidance for how you can create your own monograms in the word processing program of your choice. Free word processors include Google Docs and Apache OpenOffice, and you can download free monogram fonts to customize the look further. Offering over a dozen different monogram templates, Wedding Chicks also has a custom monogram generator on its website. The designs are a little more elaborate than most, featuring floral themes and more intricate layouts with complex geometry. Several of the monogram designs allow for full words in addition to initials. You start by choosing a template. Then, you customize the text, select colors, and adjust options like the date. You can share the resulting monogram on social media or download the PNG file after you enter your email address in the pop-up window. Fabric monogramming is the personalization of items with initials, logos, motifs, phrases, or symbols. In historical eras, monogramming was a widespread practice that served to identify either the person who owned the item or the craftsman who made it. Traditional monograms consist of a large sized first letter of the last name placed in the middle with the other, smaller initials on each side. Like other areas of crafting, the Internet features many resources for monogramming, embroidery, and free software. Learn about the rules of traditional monogramming at Embroidery Arts and access different embroidery patterns (including monograms) at such sites as Needle 'n Thread and Needle Work. Take advantage of a variety of cheap embroidery software and free embroidery patterns online as well. 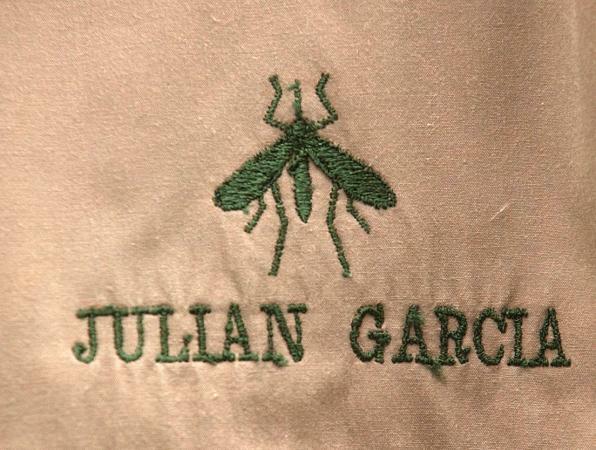 There is definitely an elevated sense of elegance and class when you have a personalized monogram on your bath towels, linens, shirts, and other items. Rather than take a default design featuring only the first letter of your last name, customize your monogram using one of the free software options above. The added dash of prestige goes a long way.